The Skeljúngur, or “shell whale” is one of the many illhveli, or “evil whales” of Iceland. Unlike its brethren, the skeljúngur is edible and safe to eat, making it the most dangerous of the edible whales. It has even helped humans on occasion; one young skeljúngur aided Hjalmper and Olvir in battle against a vicious hrosshvalur. It is described as ranging from 20 to 45 meters long. It is very fat and short-flippered, lacks dorsal fins, and its entire body is covered with shells that rattle as it swims. The shells tend to make it itchy, and it will rub its head against rocks in deep coastal waters. Despite its portly appearance, it is a fast swimmer, earning it the nickname of “tiger whale”. It dives vertically, and sleeps vertically with its head sticking out of the sea. Whether it has teeth or baleen is unclear. A shell-whale will position itself in the path of an oncoming ship, and will continue to obstruct the vessel’s course if the captain tries to avoid it. Skilled sailors should change their course fast enough to evade it, as sailing right onto it causes the whale to throw the ship and kill all on board. When destroying boats, it likes to strike them with its fins and tails. Skeljúngur armor makes them impervious to most attacks and quite fearless, and the whales will play dead to entice prey within range. The whaling ship Minerva off Grimsey thought they had killed a skeljúngur, but the seemingly dead whale immediately recovered and destroyed the boat sent to finish it off. Skeljúngurs hate the sound of iron being ground and filed. If one of these whales hears that loathed sound, it will go frantic and beach itself to get away from it. The alternate name of svarfhvalur (“iron whale”) is derived from this aversion. Skeljúngur is also another name of the humpback whale or hnúfubakur. Davidsson, O. (1900) The Folk-lore of Icelandic Fishes. The Scottish Review, October, pp. 312-332. Hermansson, H. (1924) Jon Gudmundsson and his Natural History of Iceland. Islandica, Cornell University Library, Ithaca. Larson, L. M. (1917) The King’s Mirror. Twayne Publishers Inc., New York. The Taumafiskur, or “bridle fish”, is one of the many illhveli – the “evil whales” of Iceland. It is the most dangerous and feared of the evil whales, as are the others. Its flesh is inedible, and speaking its name at sea will attract its unwelcome attention. Its name is derived from the white or pink stripes extending from its eyes to its mouth, and from its mouth outwards. These contrast sharply with its raven-black color, and give the appearance of a bridle. In the East Fjords it is known as the “big shorthorn”, distinguishing it from the “little shorthorn” or minke whale which is smaller and shorter-finned. The taumafiskur is slightly larger than the stökkull in size. Taumafiskurs are cruel, destructive, and spiteful; worse than that, they have an excellent memory and will hold grudges for as long as they live, tracking down anyone who has escaped them. They flip boats over, tear them up with their teeth, pummel them with their tails, and even get under them crosswise and fold them in half. One minister from Fáskrúðsfjörður survived a taumafiskur’s attack by clinging to the wreckage of his boat. Since then, he was unable to go to sea without the whale zeroing in on him again, seeking to kill him once and for all. Another time the crew of a Danish fishing boat sighted a taumafiskur around the Snæfellsnes glacier. They were saved by the quick thinking and skill in the dark arts of the captain, who dove overboard with a small bag in hand, and when he returned he assured them the taumafiskur would not bother them anymore. And sure enough, it was not seen again that day. Exactly what the captain used to repel the taumafiskur is unknown. The substances known to be abhorrent to taumafiskurs (and most likely other illhveli) include chewed angelica, rotting baitfish, bilge-water, cod-liver oil, live fire in a bucket, juniper, cow or sheep manure, sulfur, chopped fox testicles, and yarrow. Setting fire to these substances before throwing them overboard was believed to make them more potent. Taumafiskurs can also be distracted by loud noises and barrels thrown into the water, and sailing into the sun can dazzle them into giving up the chase. The Skoffín is one of a complex of Icelandic fox-cat hybrids with a lethal gaze, combining the cunning of the fox with the cruelty of the cat. This group also includes the Skuggabaldur, Urdarköttur, and Modyrmi, all of which are variations on the same theme; they are also linked to the “demon harriers”, foxes sent by sorcerers to maul livestock. A skoffín is born from the union of a male Arctic fox and a female tabby cat, and resembles both of them. Its gaze is so deadly that everything it looks at dies immediately, without needing to see it. Its exact appearance varies; it may even change color with the seasons like the Arctic fox does. Reports suggest that skoffíns are short-haired, with bald patches of skin throughout. Skoffín kittens are born with their eyes wide open. If not destroyed immediately, they sink into the ground and emerge after 3 years of maturation. It is therefore imperative to kill sighted kittens before they can disappear into the ground. When a litter of three sighted kittens was born at a farm in Súluholt, they were placed in a tub of urine to prevent their descent into the earth, and were drowned by placing turf on top of them. The entire tub was then tossed onto a pile of manure and hay and set on fire. The mother cat was also killed. Skoffíns are irredeemably vile and malicious, and satisfy their appetite for destruction by killing humans and livestock alike. They are best shot from a safe distance, ideally with a silver bullet and after having made the sign of the cross in front of the barrel, or having a human knucklebone on the barrel. Hardened sheep dung makes equally effective bullets. Thankfully, skoffíns are not immune to their own gaze. An encounter between two skoffíns will lead to the death of both of them. As with basilisks, mirrors are their bane. Once a skoffín stationed itself on the roof of a church, and the parishioners started dropping dead as they left the building. The deacon understood what was going on, and had the rest of the congregation wait inside while he tied a mirror to a long pole and extended it outside to the roof. After a few minutes he gave the all-clear, and they were able to leave the church safely, as the skoffín had perished immediately upon seeing its reflection. Eventually, confusion with the basilisk of the mainland muddled the skoffín’s image, leading to some accounts claiming it was hatched from a rooster’s egg. The skuggabaldur (“shadow baldur”) or finngalkn has the same parentage as the skoffín, but is born of a tomcat and a vixen. It has very dark fur shading to black, sometimes has a deadly gaze, and preys on livestock. It may be killed in the same way as the skoffín. One particularly destructive skuggabaldur in Húnavatnssýslur was tracked down and killed in a canyon; with its last breath, it exhorted its killers to inform the cat at Bollastadir of its death. When a man repeated that incident at a Bollastadir farm, a tomcat – no doubt the skuggabaldur’s father – jumped at him and sank its teeth and claws into his throat. It had to be decapitated to release its hold, but by then the man was dead. The urdarköttur (“ghoul cat”) or naköttur (“corpse cat”) is of less certain parentage. It may be a hybrid, but other accounts state that any cat that goes feral in Iceland eventually becomes an urdarköttur, and all-white kittens born with their eyes open will sink into the ground and re-emerge after three years in this form. Shaggy, white or black furred, growing up to the size of an ox, these felines kill indiscriminately and dig up corpses in graveyards. It may be killed in the same way, and is attached to the same story as the Bollastadir cat. Gryla’s pet, the Yule Cat, is most likely an urdarköttur. The modyrmi (“hay wormling”) is a canine variant, created when puppies born with their eyes open sink into the ground and reappear after three years as wretched, virulent monsters. The specifics are the same as with the skoffín. Boucher, A. (1994) Elves and Stories of Trolls and Elemental Beings. Iceland Review, Reykjavik. Stefánsson, V. (1906) Icelandic Beast and Bird Lore. The Journal of American Folklore, vol. 19, no. 75, pp. 300-308. The Katthveli (“Cat-whale”), is one of Iceland’s many evil whales or “illhveli”. It is generally smaller and of a less harmful nature than its larger brethren, and has even been tamed on occasion. As with other illhveli, it is inedible and will zero in on anyone who mentions its name. Speaking about it at sea is considered highly foolish. The katthveli has been described as a seal, dolphin, or whale with bulky forequarters and narrower hindquarters, with the mouth of a leopard, the strength of a lion, and the hunger of a hound. It earns its name from the long, furzy whiskers on its snout and the sounds it makes, ranging from a purr when it exhales to mews and hisses when agitated. It is fairly small and kittenish at 16 cubits (8 meters), with a short rounded head with nodules that resemble ears. It has short, sharp teeth protruding from its upper jaw, and Saint Brendan adds that it has boar’s tusks. The eyes gleam brazenly. The flippers are large, and nasty hooked claws are present. Known colors include pink, grey, peaty brown, and countershaded; the one encountered near the Faroe Islands was pale under the chin and had woolly skin. Katthvelis have been known to school with rorquals and large fish. These whales are cruel and vicious, using their speed and agility to swim underneath boats and flip them. One katthveli chased a boat off the Skálanesbjarg cliffs, but gave up after it was outsped by the rowers. Another one intercepted a ship at Héradsflói and remained alongside it, preventing the sailors from fishing and following them with its eyes. Harpooning it was ruled out as nobody wanted to provoke it, and it eventually dove and disappeared by nightfall. Ásmundur Helgason and his companions were attacked by one off Seley Island; it rammed their boat and stuck its head through the hull. After a terrifying struggle, they managed to push it out and make for safety despite the damage. A Faroese katthveli at Suðuroy reared out of the water and put its flippers on the gunwale of a boat, hissing and spitting like a cat and snapping at the sailors until one quick-thinking man put his gun in its mouth and fired, whereupon it slid off into the depths. St. Brendan encountered a “sea-cat” the size of a horse on a small island. It had originally been brought as a pup along with twelve pilgrim sailors, and was quite friendly and tame, but soon grew bigger and hungrier and eventually ate all but one of the sailors, who took refuge in a small stone church. St. Brendan prayed for aid, and immediately a great whale lunged out of the sea and seized the sea-cat, pulling it into the sea where they both drowned each other. The wolffish Anarhichas lupus was also known colloquially as the cat-fish or sea-cat in older English, and may be associated with the katthveli. If it was born from mistaken identity, a large seal such as the walrus or bearded seal is a more plausible contender. Cunningham, J. T. (1896) The Natural History of the Marketable Marine Fishes of the British Islands. MacMillan and Co., London. Joensen, J. P. Tradition and Changes in the Concepts of Water-Beings in Faroese Folklore. In Lysaght, P.; Ó Catháin, S.; and Ó hÓgáin, D. (1996) Islanders and Water-Dwellers. Proceedings of the Celtic-Nordic-Baltic Folklore Symposium, DBA Publications, Dublin. Stokes, W. S. (1890) Lives of Saints from the Book of Lismore. Clarendon Press, Oxford. The Nauthveli or Nauthvalur (“Ox-whale”) is one of the many illhveli or “evil whales” of Iceland. It is the second biggest of the evil whales, and like the others, it is inedible and will show up if its name is said out loud. A nauthveli is a toothed whale, bicolored much like a cow. The large head is similar to that of a bull and has two nodules on top. The trunk tapers off, wormlike, and lacks fins. However, the nauthveli is named not for its appearance, but rather for the terrifying bull-like bellow it makes when hungry, a sound like that of roaring, maddened bulls. The call of a nauthveli is made in the open sea or near the shore, and can be heard reverberating over long distances. The vibrations cause the ground to shake and knock oars out of sailors’ hands. Going out to sea is forbidden if nauthveli bellowing can be heard. As will all evil whales, the nauthveli delights in killing men and scuttling smaller boats, but it has a particular fondness for beef. The bellow of a nauthveli is hypnotic to cattle, compelling them to run off cliffs and headlong into the sea. There the nauthveli plays with them like a cat does with a mouse before biting them in half and eating them. The whales are attracted to cattle on board ship; one nauthveli off Grimsey harassed a vessel until they released the one cow on board, who promptly dove into the sea. Cattle have to be locked up for days until the nauthveli’s spell wears off, and indeed cow-herding was strongly discouraged in areas where nauthvelis had been heard. Sacrificing one bull or cow usually satisfies the nauthveli, making it safe to go out to sea again. Gudmundsson listed the nauthveli as synonymous with the búrhvalur or sperm whale. The Hrosshvalur, or “Horse-whale”, is among the most cruel and dreaded of the Icelandic illhveli, or “Evil Whales”. Only the Stökkull and Raudkembingur rival it in malice. It is irredeemably evil and is unfit for eating, its flesh vanishing from the pot if cooked, and its consumption was banned by law. The hrosshvalur is easily confused with its fellow illhveli; notably, it has a red crest similar to the raudkembingur, and tends to jump onto ships like the stökkull. 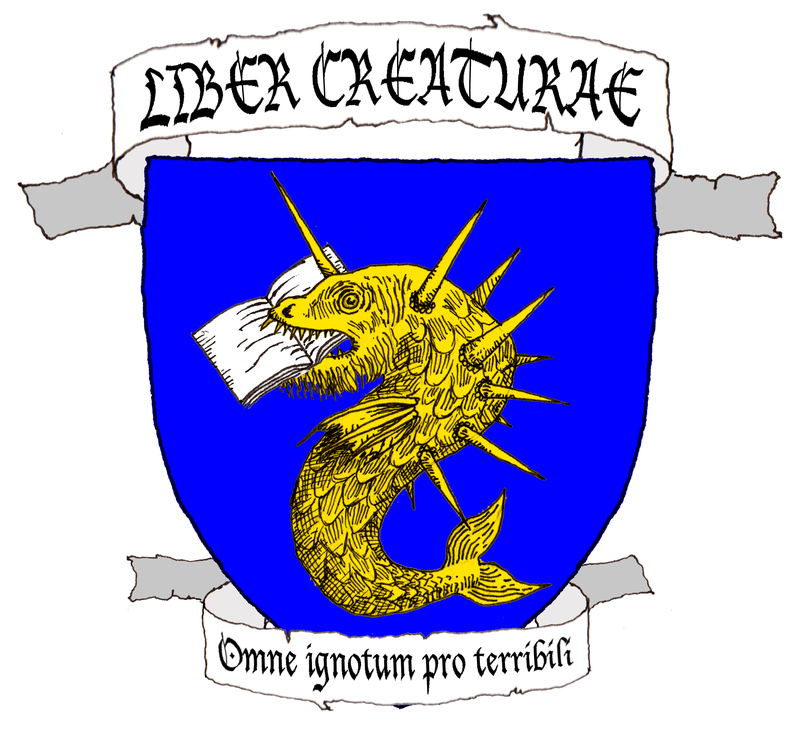 It is distinguished from those two by its enormous eyes, which have earned it the nickname of Monoculus (“One-Eyed”). It earned its name from a somewhat equine head, a flowing red mane covering more or less of its neck, a horse’s tail, and a call like a horse neighing. It also smells bad, is covered with fine fur, and its insides are like those of a horse. Jon Gudmundsson, who confused it with the stökkull, depicted it with a dappled back. These whales grow 30 to 80 cubits (15 to 40 meters) long. As with other illhveli, the hrosshvalur delights in destroying ships. A hrosshvalur will charge over the waves at high speed, holding its head just above the water with its mane trailing behind. These whales sink ships by jumping onto them, or pressing their weight on them until they capsize. Horse-whales are also portents of bad weather, and can create huge waves by whipping their tails. A number of euphemistic names are used to refer to horse-whales, to avoid attracting their attention. While not as easily distractable as raudkembingurs and stökkulls, their large eyes are a notable weakness. In the 13th century, a hrosshvalur that surfaced alongside a ship was bombarded with every heavy implement available, which caused it to sink back below the waves. Another hrosshvalur attacked the heroes Hjalmper and Olvir; it was defeated with the help of a Skeljungur (“shell whale”), vagnhvalur (“chariot whale”, or killer whale), and two vultures. A cutlass thrown into one of its large eyes weakened it significantly, and it was torn apart by the whales. Hrosshvalurs are also associated with the dark arts. The size and ferocity of the horse-whale made it an excellent accomplice for sorcerers and witches bent on destruction, and a perfect form to assume when causing chaos. In the Kormaks saga, the witch Dorveig transforms herself into a hrosshvalur to attack the brothers Kormakr and Dorgils. They recognize her from her eyes, and drive her off by throwing a javelin into her back. It is generally believed that the hrosshvalur was derived from the walrus, and ultimately gave it its name by converting hval-hross to walrus. However, it was clear early on that it and the walrus were very different animals, as Gudmundsson separately describes both the hrosshvalur and the walrus (rostungur) in detail. Another possibility would be the giant squid, which would have contributed the large eyes and a mane of tentacles. Dillmann, F. Les Yeux de Dorveig: À propos de la métamorphose en hrosshvalr d’une sorcière de la Kormaks saga. In Heizmann, W. and van Nahl, A. (2003) Runica – Germanica – Medievalia. Walter de Gruyter, Berlin. Fraser, F. C. An Early 17th Century Record of the Californian Grey Whale in Icelandic Waters. In Pilleri, G. (1970) Investigations on Cetacea, vol. II. Benteli AG, Bern. A malicious Icelandic wizard once revived a dead, half-rotted eel, giving rise to an evil and toxic creature. It was the first Hrökkáll, or “coil-eel”. The wizard may be long dead, but the eel’s descendants went on to infest polluted waters. 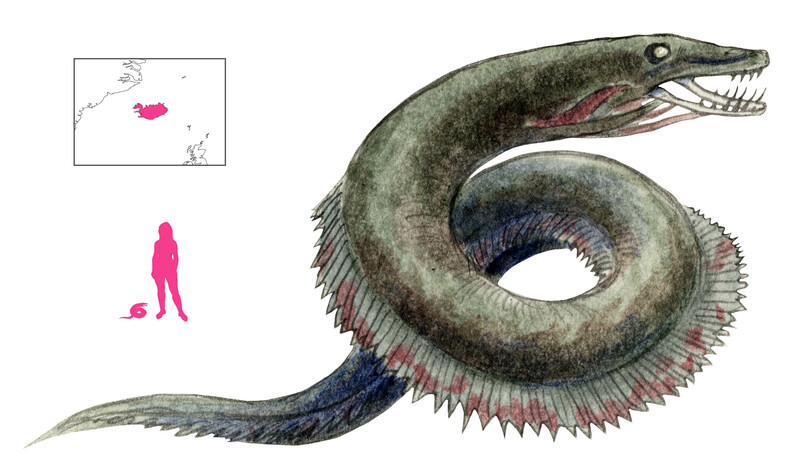 A hrökkáll is two feet long, and resembles an eel in appearance. It lives in still ponds and stagnant water, and occasionally in running rivers. It has flexible, iron-hard scales, and sharp saw-toothed fins. As with many Icelandic fishes, it secretes corrosive venom and its meat is poisonous. Captured hrökkálls have been known to melt their way through earth and rock to squirm back into the water. Hrökkálls lie in wait until someone steps in the water. Then they coil around the person’s leg and constrict it, slicing into flesh and bone alike and amputating the limb. It is unknown whether hrökkálls use their acidic venom or their bladed fins (or both) to do this. They will dismember humans and horses in this way, but sheep are safe as their legs are too narrow for the hrökkáll to gain a hold. Hrökkáll in common parlance has since evolved to mean electric eels. Zoëga, G. T. (1911) English-Icelandic Dictionary, Second Edition. Sigurdur Kristjansson, Reykjavik.